GLENDALE, Ariz. — Max Domi had been a cornerstone of the Arizona Coyotes‘ rebuilding project in the desert. He was young, feisty, skilled and had a great hockey pedigree. Now the Coyotes have a new, young cornerstone who also happens to fill a need at center after trading Domi to the Montreal Canadiens for Alex Galchenyuk on Friday night. The 23-year-old Domi was targeted to be part of a youthful new foundation for the struggling Coyotes when they selected him with the 12th overall pick in 2013. The son of former NHL tough guy Tie Domi, Max scored 18 goals and had 34 assists as a rookie in 2015-16, but his goal production has dipped the past two seasons. He had nine goals and 29 assists in an injury-plagued 2016-17 season, and nine goals with 36 assists last season. 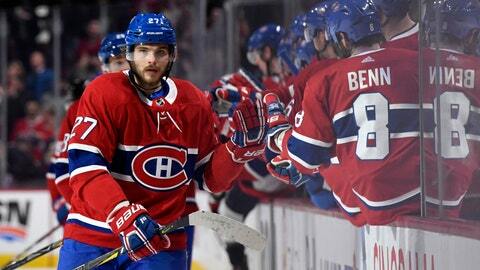 The 24-year-old Galchenyuk has been a steady scorer since Montreal selected him third overall in 2012. He has eclipsed 20 goals twice, including a career-high 30 in 2015-16. Galchenyuk had 19 goals and 32 assists last season. Galchenyuk signed a three-year $14.7-million contract in July 2017 that carries a salary cap hit of $4.9 million per season. Domi is coming off his entry-level contract and will need to sign a new deal. Galchenyuk was born in Milwaukee when his father, Alexander Galchenyuk, was playing for the Wisconsin city’s minor league team. The family returned to Europe when Alex was 4 years old.